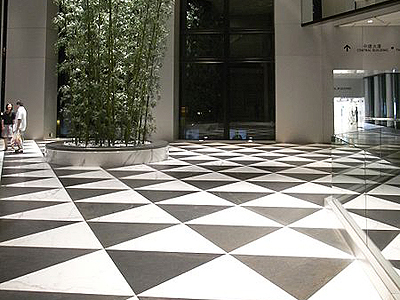 Nothing gives you more options and opportunities to style your commercial space than tile. Choose stone, ceramic or porcelain, and arrange it in nearly endless patterns. With many colors, patterns and sizes to choose from, there are countless ways to make use of tile in your space. A long-time favorite in the food industry, tile is just as suitable in kitchens or outside venues for its ability to resist spills. Explore the nearly infinite palette of styles and colors available in tile to create the floor you always imagined in any area of your business. When it comes to flooring, nothing gives you more options and opportunities to express your unique vision than tile. Choose stone, ceramic or porcelain, and arrange it in nearly endless patterns. Floor tile works from contemporary to classic. With so many colors, patterns and sizes to choose from, there are countless ways to make use of tile in your commercial space. You can lend other areas throughout your commercial location a touch of style, ranging from contemporary to traditional. No matter what your architectural style, there’s a tile solution to bring your vision of your business. And tile isn’t merely a trendy choice, either. It’s been an admired flooring for years and will continue to be a great way to bring lasting beauty and value to your commercial space.